Aaron Burr has become known as one of America's great villains. He famously shot Alexander Hamilton in a dual. The interesting thing though is when he was later accused of treason, it was for something totally unrelated to the gunfight. Fortunately for Burr, between the Broadway show 'Hamilton' and the great biography by Nancy Isenberg, he has been viewed with a bit more sympathy in recent times. Orphaned at the age of 2, Aaron Burr lived with several family members and friends as a child. Despite these circumstances, he was able to graduate from Princeton by the time he was 16. Burr moved to Connecticut to study theology. Soon after his arrival, the Battle of Lexington and Concord changed his life forever. The potential for glory drew many young men of Burr’s middle-class stature, and he was no different. Burr’s first major action in the Revolutionary War came when he joined Benedict Arnold on his dangerous journey through the Maine wilderness to Quebec. Aaron was sent to meet Major General Richard Montgomery at Montreal and accompany him to Quebec. Burr participated in the failed battle that soon followed but made a name for himself for his bravery. Burr was briefly a member of General Washington’s staff, but preferring the battlefield, he quickly resigned. He would see action in the early battles of New York and New Jersey. Burr, having been passed over for a promotion, left the Continental Army and began to study law. By 1782, the veteran had obtained his degree and passed the bar. He began practicing in New York City. When the war ended, Burr spent time in the New York State Assembly. As the U.S. Constitution came into effect, political changes swept across the States. During this shakeup, Burr became the Attorney General of New York. Burr is most famous for his legendary duel with Alexander Hamilton. One of the first steps toward this fight was in 1791, when Burr defeated Hamilton’s father-in-law Philip Schuyler in an election to represent New York in the United States Senate. At this time, the first political parties were taking shape. Hamilton was the leader of the Federalist Party. Burr, though considered a moderate by his contemporaries, sided with Thomas Jefferson and James Madison as a Democratic-Republican. Burr became popular enough among voters to run for President in the election of 1796. At this time, the person who received the most votes became President and he who received the second most became Vice-President. Burr came in fourth behind John Adams, Jefferson and Charles Coatesworth Pinckney. Four years later the rules for voting had been changed. Presidential candidates now ran on a ticket with their preferred Vice-President. Thomas Jefferson decided to run with Burr. Aaron was able to get Jefferson the votes of New York, one of the important Swing States of the day. The problem was, they tied. Although everyone expected Jefferson to receive the position, Burr did not back down. It was not until Hamilton publicly persuaded the Federalists to support Jefferson (his arch enemy) over Burr that the matter was settled. Despite his now tense relationship with Jefferson, Burr was still the third Vice-President of the United States. It seems he was respected while presiding over the Senate, his moderate positions earning the trust of most of his colleagues. The largest precedent he set as Vice-President was during the impeachment trial of Supreme Court Justice Samuel Chase. Many of his rules and guidelines are still in use today. For his second term as President, Thomas Jefferson chose long time New York Governor George Clinton as his running mate. This made Burr one of the only lame duck Vice-Presidents in U.S. history. Aaron decided the best course of action was to run for Clinton’s seat as Governor of New York. During this time, Alexander Hamilton’s criticism of Burr was published in a newspaper. The two men exchanged several letters until Burr challenged Hamilton to a duel. While there is much disagreement as to precisely what happened during their engagement, we do know that the two men met in New Jersey (where the punishment for dueling was less severe) and Burr shot Hamilton. Alexander died the next day. Burr fled south, ending up in Washington DC where he finished his term as Vice-President. Aaron Burr would leave Washington DC and head to the Louisiana Territory which America purchased during his Vice-Presidency. He gathered a militia to take with him, apparently planning an invasion of Spanish Territory (known at the time as a filibuster). Soon after, President Jefferson caught wind of his plans. Since this type of invasion was illegal, Jefferson accused Burr of treason and issued a warrant for his arrest. Burr twice turned himself in and was twice released by local judges. He was then taken back to the capital where he was tried for treason by the Supreme Court. Despite the Jefferson Administration’s best efforts, Chief Justice John Marshall ruled that Burr did not commit treason as defined by the Constitution and he was released…financially and politically ruined. Aaron Burr first made a name for himself as a soldier in the Continental Army. He furthered his reputation as a moderate during a time of hyper-patrician politics. Burr even managed to become the third Vice-President of the United States of America. But he was undone by a petty duel with an old friend and a mistaken adventure into Spanish Territory. He was a true Founding Father who history is still trying to judge properly. 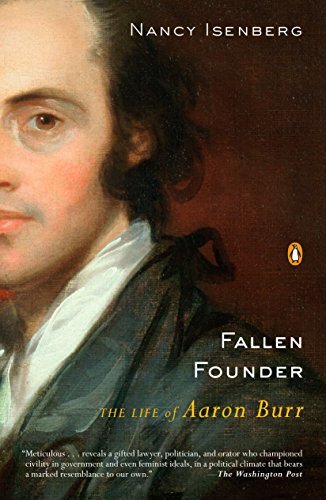 If you are interesting in learning more about Aaron Burr, I strongly recommend 'Fallen Founder' by Nancy Isenberg. Gore Vidal also has an interesting account of Burr's life. Remember, all books purchased through this website go through Amazon. Although we do get a commission, Amazon's price does not change. And if you haven't yet, don't forget to subscribe to our email list for a new Founder Every Day.